Potential treatment outcomes can be roughly anticipated based on Dupuytren joint involvement. 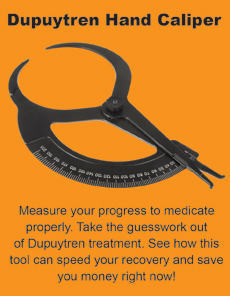 This is especially helpful when dealing with someone who has a Dupuytren diathesis and is attempting to avoid Dupuytren surgery. There are three joints of any finger that can be affected in Dupuytren contracture, although it is the 4th (ring) and 5th (little) fingers by far that are most often involved. When a joint is affected by Dupuytren contracture it will be kept into a gradually advancing flexed or bent posture, curled down toward the palm. When the proximal interphalangeal joint is involved in Dupuytren’s contracture, any form of treatment is more prolonged and difficult, especially surgical treatment. It is important to note which joint is affected when Dupuytren contracture occurs because the prognosis and the degree of difficulty of treatment are suggested by which joint or joints are involved in the finger contracture process. Dupuytren contracture involving only the PIP joint usually takes longer to treat successfully and sometimes requires extended treatment after initial straightening since recurrence might develop if treatment is stopped too soon. This is especially true of the 5th or little finger. Dupuytren contracture which affects only the MCP joint is usually the most responsive to conservative Alternative Medicine treatment methods. When Dupuytren contracture extends to both MCP and PIP joints of the same finger it tends to statistically improve the therapeutic outlook when compared to those cases of an isolated PIP contracture. Outcomes to aggressive Alternative Medicine treatment for Dupuytren contracture are very favorable, especially when combined with light stretching of the flexor muscles and fascia. There is a variation of the combined contracture of the MCP and PIP joints, discussed above, that includes the DIP joint when it is bent upwards or in an extended direction. Typically, in Dupuytren contracture the finger bending is in the direction of a downward or flexion deformity, curled toward the palm. In this variation, called a “Boutonniere deformity,” while the usual two joints (MCP and PIP) are flexed downward, and the last joint (DIP) is extended upward. We have observed, and confirm the finding of others who report, that the boutonniere deformity of Dupuytren’s contracture is more difficult and prolonged to treat and has a higher recurrence rate than the other finger flexion patterns.